Part 3: What is the Best Column ID for You? Hi, and welcome back to the third installation of this article series on the effect of changing column inner diameter (ID) in chromatography. So far, we have taken the test probe, 17-alpha-OH-progesterone, and run a simple linear gradient on the LC-MS system using columns with 4.6 mm, 3.0 mm, and 2.1 mm ID (all 50 mm length and packed with Kinetex® core-shell 2.6 µm C18 media). In one set of experiments, the column ID changed and we adjusted the flow rate proportionally (1, 0.43, and 0.2 mL/min for 4.6, 3.0, and 2.1 mm ID, respectively) to maintain the same linear velocity of mobile phase through the column. In the 2nd set of experiments, the flow rate was set at a constant 0.5 mL/min for all three columns. We found that changing the column ID had effects on peak height response, back pressure, and elution time. 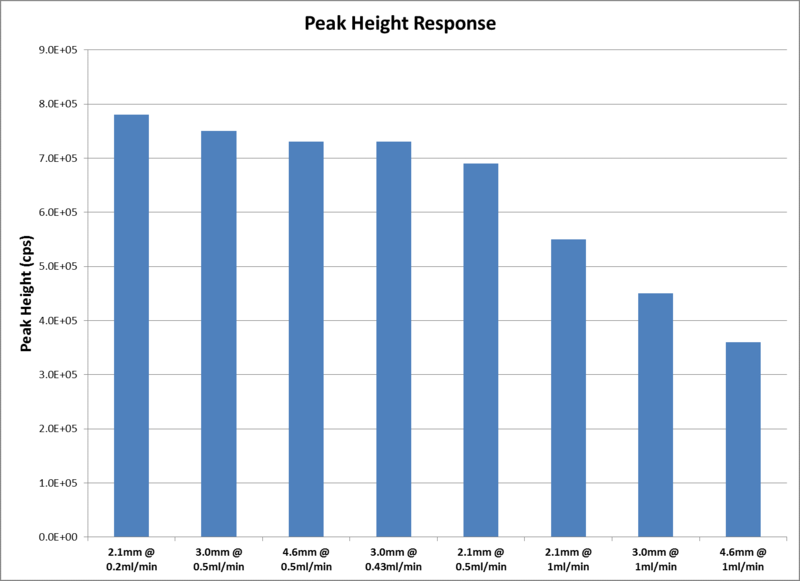 In general, as the ID decreased, there was an increase in peak height response, which is great! But the data gets a little messy when you consider the fact that changing flow rates also influences pressure and run time. Sure, one column may have given a great peak height response, but the cost would be high pressure and/or longer run time. Ultimately, it’s a balancing act and every analyst would need to decide what factor is most important to them. To try and make sense of the data, see the bar charts below for each performance parameter, which are included in Figures 1, 2, and 3 for peak height, run time, and back pressure, respectively. These charts make it a bit easier to visualize how different combinations of flow rate and column ID are translated into chromatographic performance. For example, for peak height, you can see that the greatest peak intensity was achieved using the 2.1 mm column run at a flow rate of 0.2 mL/min (Figure 1), but this combination also had the longest run time (Figure 2). So, if you only care about sensitivity, then that is the logical choice. But, if you need to factor in productivity, you might want to consider a different format. For instance, by moving to the 50 x 3.0 mm column at a flow rate of 0.5 mL/min, we sacrifice only a small amount of sensitivity (in our testing), but cut run time down by about 30 %. An added benefit is that the 3.0 mm column at 0.5 mL/min also gave one of the lower system pressures (Figure 3). The biggest take-home I see from this data was that the 3.0 mm column operated at about 0.5 mL/min represented a “sweet spot” of performance on our LC-MS system (Agilent® 1200 series LC system and API 4000™ MS (SCIEX®)). Sensitivity was close to the optimal, but operating pressures and run time were both at the lower end of the spectrum. However, all this data is based upon a single well-behaved test probe. Will these assumptions transfer over to a more “real-world” sample”? We’ll find out in our next article as we test real world samples and put our interruptions to the test. Next Next post: Doing HPLC Method Development for Monoclonal Antibody Aggregates? Wait a “SEC”!